This article is about the competitive event. For the airshow disaster, see Flugtag '88. Red Bull Flugtag (German: flight day, airshow) is an event organized by Red Bull in which competitors attempt to fly home-made, human-powered flying machines, size-limited to around 10 metres (33 ft), weight-limited to approximately 150 kilograms (330 lb). The flying machines are usually launched off a pier about 9 metres (30 ft) high into the sea or body of water. Most competitors enter for the entertainment value, and the flying machines rarely fly at all. The format was originally invented in Selsey, a small seaside town in the south of England under the name "Birdman Rally" in 1971. The first Red Bull Flugtag competition was held in 1991 in Vienna, Austria. It was such a success that it has been held every year since and in over 35 cities all over the world. Anyone is eligible to compete in the Flugtag event. To participate, each team must submit an application and their contraption must meet the criteria set forth by Red Bull. The criteria vary with location. In the United States each flying machine must have a maximum wingspan of 30 feet (9.1 m) and a maximum weight (including pilot) of 450 pounds (200 kg). In Australian Flugtags the wingspan is limited to 8 metres (26 ft) and the weight (not including pilot) to 180 kilograms (400 lb). The craft must be powered by muscle, gravity, and imagination. Because the aircraft will ultimately end up in the water, it must be unsinkable and constructed entirely of environmentally friendly materials. The aircraft may not have any loose parts and advertising space is limited to 1-square-foot (930 cm2). Teams that enter the competition are judged according to three criteria: distance, creativity, and showmanship. The record for the longest flight is 258 feet (78.6 m), set September 21, 2013, at the Flugtag in Long Beach, California by "The Chicken Whisperers" team in front of a crowd of 110,000. The largest crowd was in Cape Town, South Africa with 220,000 attending in 2012. Aircraft Description: Carbon fibre and mylar glider, pilot lying prone. Aircraft Description: Polystyrene and aluminum. Aircraft Description: Kevlar, aluminum, titanium, carbon fiber and mylar. Aircraft Description: Aluminum sheets and wrapping plastic. Aircraft description: Household soap ("Savon de Marseille" in French) on a huge facecloth. Aircraft description: The biplane with a cob of corn instead of the fuselage. The Portland, Oregon, competition, held on August 1, 2015, at Tom McCall Waterfront Park (wherein craft were launched into the Willamette River), was ended early by the United States Coast Guard after an excessive number of spectator boats (over 500) filled the river, making it impassable to commercial traffic. One collision was reported between a spectator boat and a commercial vessel, though damage was minimal and no injuries occurred. The Red Bull Flugtag is featured as a playable mini-game in a special "Red Bull space", called the Red Bull Beach, in PlayStation Home released on November 26, 2009. ^ Movie of "piano injury" event and followup. ^ Locust_Star (2009-11-25). "This Week in PlayStation Home: New Red Bull Space + Event, Fight Night Producer Chat & More". Sony Computer Entertainment. Retrieved 2009-11-25. "The History of Flugtag." 1st Red Bull Flugtag Sydney. Red Bull. 14 Apr. 2008: . "Events." Red Bull Flugtag USA. Red Bull. 2 Aug. 2008: . "What is Flugtag?" Red Bull Flugtag USA. Red Bull. 2 Aug. 2008: . 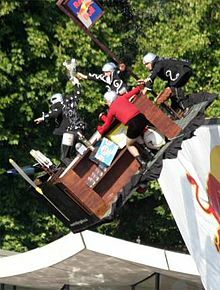 Wikimedia Commons has media related to Red Bull Flugtag.